Well these past few weeks have been very eventful. I flew in Ariel Beck to train with us at Syndicate for a week! 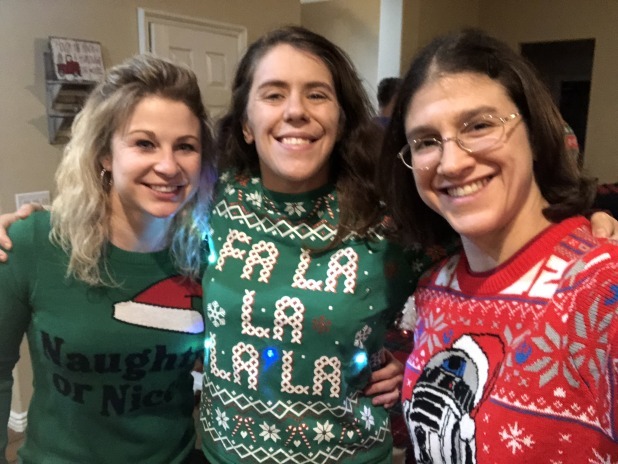 I met Ariel on The Ultimate Fighter season 26, and despite being on the other team (Team Alvarez), we chatted and made friends living in the same house. December is kind of a slow month for Syndicate…I guess people don’t want to come to indoor practice because it’s a frosty 50 degrees outside….? Just kidding. (actually, I’m not kidding) But anyway it was great to have her here. Just like her nickname “Sunshine,” she is super sparkly and positive. It makes sense for us to be friends. And actually, I really needed that sunshine this week. 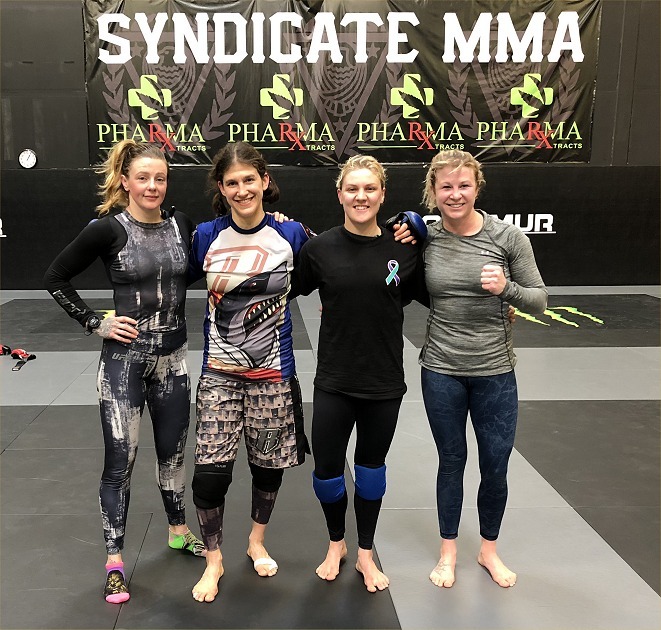 A few weeks ago, one of our fighters Jessy left Syndicate. It’s too bad she felt so negatively about a place I feel is positive and I love so much. Just goes to show that everybody is different! I wish her the best of luck wherever she goes next. 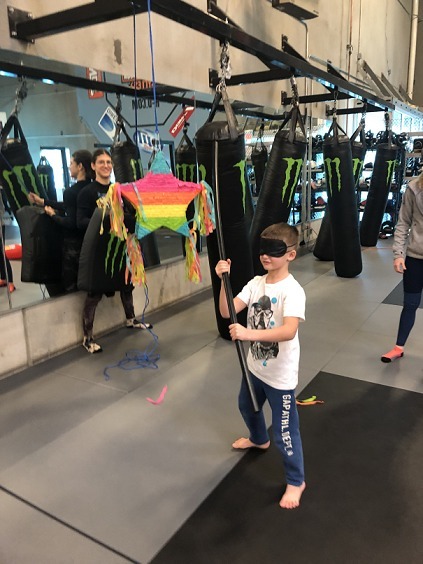 I ended up helping teach the little kids Muay Thai class, which was stressful but I feel accomplished that I started figuring it out. Serena had surgery early December to repair a damaged body part, which is good because she was kind of stagnating and just waiting, not really being able to train. I really miss training with her. Jeslen, ammy fighter, pro wrestler, and my new friend has been helping me teach little kids jiujitsu in Serena’s place. She’s a life-saver! Thank you!! 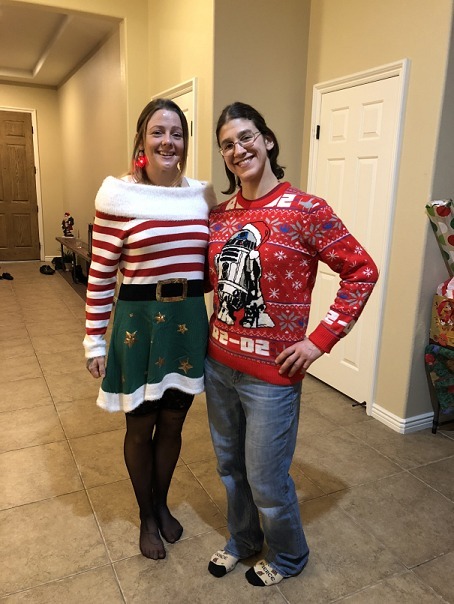 I organized a gym Christmas party with Mama Wood. I’m not even sure how many adults came because I was so busy making sure the kids were okay and entertained. A bunch came. I had bought a pinata and Ariel helped me stuff it and figure out how to hang it. IT WAS AWESOME!! 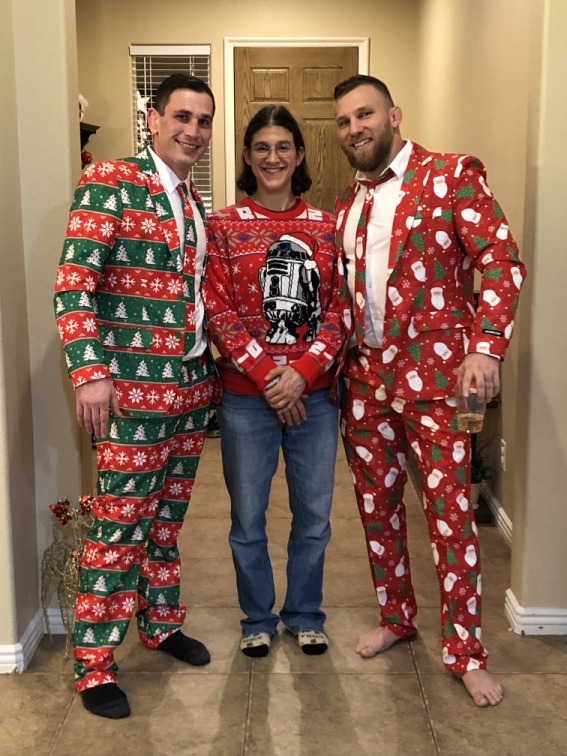 Then Coach John had a fighters “Ugly Christmas Sweater party” at his house, and it was really nice and fun. Sunday, I took Ariel to hot yoga at Vegas Hot! 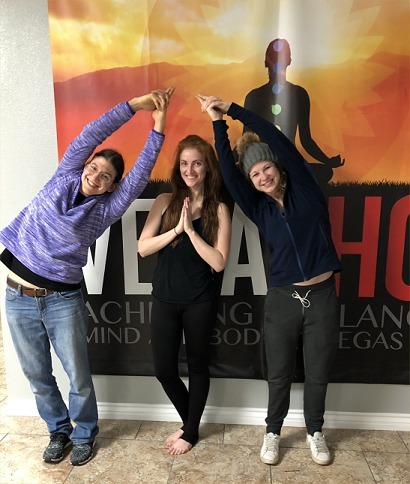 Best Yoga studio in Vegas! we saw a movie with Serena! Ralph Breaks the Internet! It was great! Monday the 17th came along, and my friend and one of my favorite training partners left the gym. That makes me very very sad. I know she’s an adult and can make her own decisions. I wish you happiness and health wherever you go, buddy. Focusing was a challenge after that, but I managed to practice. Thank you, Sunshine, for your emotional support, and of course, training. You’re a great training partner. I like how you pull your punches so I know you’ve hit me, but you don’t smash me. I don’t have to worry about concussions or anything like that when sparring. 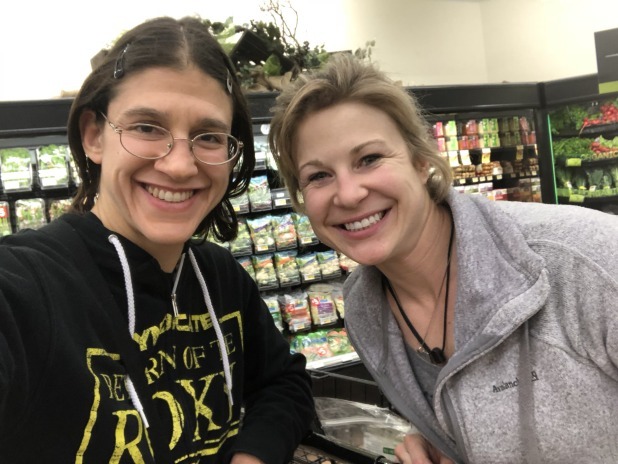 Sarah Kaufman arrived and I got to train with her! She’ll be here for a few weeks helping JoJo with her fight camp as well, so that’s cool. I get to train with her, as well. Yay. She gave me socks. Ariel helped me teach kids on Monday, which was nice to have the help, and also on Wednesday. She wanted to get kid-teaching experience and observe someone else’s class, which is the right way to go about becoming a great kids teacher! I learned from many people myself, like Alberto, Chris, Damien, and Evan Dunham, in addition to drawing on my academic experience at Berlitz. Teaching sports is a whole different animal. Yesterday, my fan-friend Jay AKA “Passive Jay” on Twitter and the Underground came to Vegas and took me, Serena, and Ariel out for dinner. Thanks so much!! It was great seeing him again. 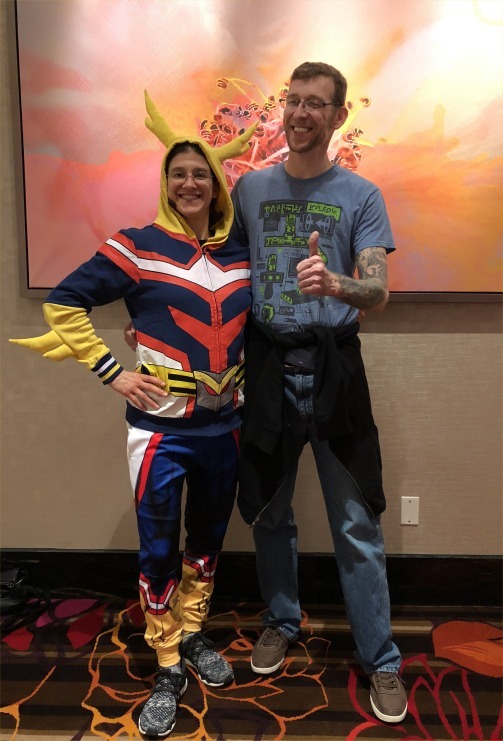 We went to the mini arcade above the Orleans Casino, where they actually have, fun, unique games! 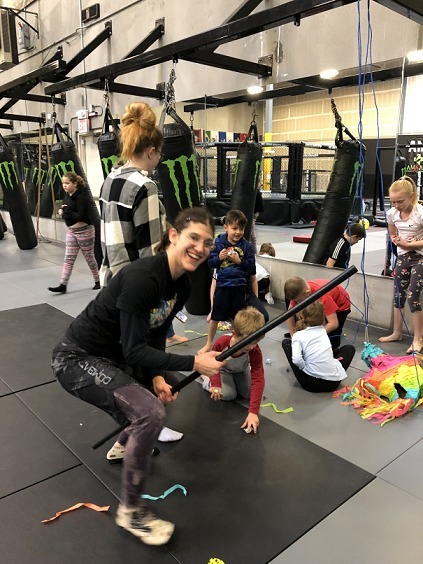 Hopefully things will start to settle down with kids classes soon….. my jiujitsu classes are going well. I just announced the first test date in February. I’m not sure when my next fight is. I’m trying to lower my weight and get back in shape after a week of being sick and then one week away for Thanksgiving. Every day I’m learning new things and bettering myself, so I’m SO thankful for that. I’m training with Lorenzo and getting stronger. Things are going well for me.